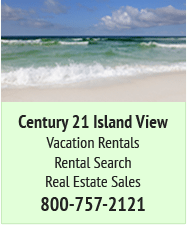 I have rented from Century 21 Island View Realty http://www.navarreeach21.com every time my wife and I rented since 1993. We stayed in various size units from 2br to 3br in Sugar Beach Townhomes, Sun Dunes ,NB 1st major high rise now dwarfed by the East end giants, to Beach house rentals. Very convenient lock box for late night arrivals and early early checkout. Very professional even when we had advanced notice of possible NB closing from Hurricanes projected tracks. 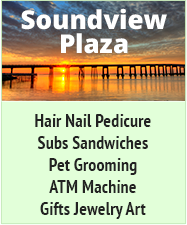 They were very helpful assisting us in finding accommodations in Destin when threats were up that the SR Island might be closed from Hurricane threats well in advance. All Units were very clean, well supplied, professionally managed and reasonable priced. We just checked in at Summerwind and from the looks of the beach, it's the place to be! It is less crowded here than west beach! jpigott73 wrote: We just checked in at Summerwind and from the looks of the beach, it's the place to be! It is less crowded here than west beach! Will be out in a couple of hours as one of the Marine Park pavilions today for the Navarre Krewe of Jesters Memorial Day Cookout. Hope the extra lane coming off the beach helps later this afternoon! Update: I stayed at Caribbean Resort in a Penthouse Unit earlier this month. It was beautiful! The building is older but very well kept. The pool area was very nice and had a shady seating area to get out of the sun. The beach was beautiful as always and the guys doing the chairs were very nice and helpful. 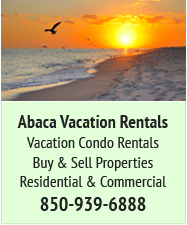 It was a really nice trip and I would stay at this Condo complex anytime. I did a direct rental on VRBO about 6 hours before I arrived. Of course it was not high season but the process could not have been easier. I love the electronic locks on the doors and no need to keep up with keys- just set your own code and go. Thanks for all y'alls help, now next year we'll know some options! Anyway, out of all the condos I have owned and managed, by far, the full time owners, most of whom sit on the HOA Board, are the best at keeping the building, grounds and all common areas in excellent shape. 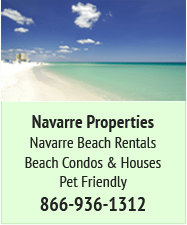 We were the only gated condo on Navarre Beach for many years. 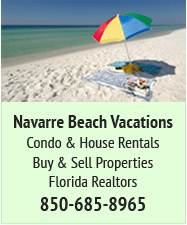 If you have not visited Navarre Towers lately go check it out. Can't speak for everyone but my condo is full of guests ALL year long. They love Navarre Towers. You were right about it being on the "quiet" end of the beach. I certainly agree with that. HOA at Navarre Towers has maintained a very high standard in building maintenance. We are in the process of recoating the outside of the building. They just added an basketball court and two shuffle board courts ?? don't know if that is what their called but, we got two. Still have one tennis court and exercise room. The building manager (works for Dale E Peterson) is one of the most professional managers on the beach. As far as units go, we have redone bathrooms, kitchen, both with custom cabinets. New travertine floors, 55 in. HD TV with sound bar.